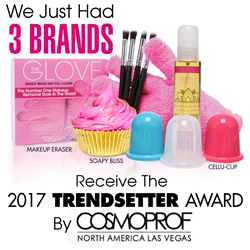 MakeUp Eraser​, ​a Phoenix family-owned business that has brought ​new revolutionary beauty products to the marketplace for millions of women, is excited to announce three of their products received the 2017 Trendsetter Award. The awards were presented July 9th through July 11th at the CosmoProf beauty show in Las Vegas, Nevada; the biggest beauty show in the country. MakeUp Eraser Glove​: A product that cleans your makeup brushes without cleansers. It can be used in the shower to help clean and exfoliate the body and is reusable up to one-thousand machine washes. Soapy Bliss​: Bath bombs, lotions and scrubs that are handcrafted in Arizona and made with natural, organic ingredients. Cellu-Cup​: Beauty solution product for diminishing cellulite. of the top trending beauty products and many others visit https://makeuperaser.com. Founded in 2012 by Daniel and Elexsis McCarthy, The Original MakeUp Eraser is America’s number one makeup remover. It’s an all natural method to remove makeup. No harsh chemicals are used in the product and the makeup is taken off with just water. It’s a revolutionary tool used by millions of women worldwide. Since the launch of MakeUp Eraser, MUE Lifestyle, the parent company has brought new products to the marketplace that compliment the MakeUp Eraser.